Most people outside of Brazil don’t know what favelas are, and many people who think they know what favelas are, either oversimplify them to “slums” or understand them by their negative stereotypes from media such as “City of God” and “Fast Five.” The reality of these communities is much more complex and fascinating, and I’m only just beginning to learn about them. Basically, favelas are squatter settlements, which were first settled illegally. Favelas began in Rio in the 1890s, and they grew to prominence in 1897 upon the return of 20,000 soldiers to Rio from the Canudos War in Brazil’s Northeast. During that military conflict, the soldiers were close to a hill called “Favela,” which ultimately became the name for the first hill in Rio they occupied in mass. The name of that hill is now Morro da Providência (“Providence Hill”), but by the 1920s, “favela” became the de facto name for such squatter settlements in Rio. I’ve also heard that favelas’ name comes from the favela plant (which when cut down, quickly grows back) because of the forced removal of favela residents and their subsequent return. Regardless, in the last century, around 700 favelas came to exist in Rio, and now at least 20% of the city’s population resides in these communities after waves of immigration largely from poor Northeastern states. For people who have learned about favelas through mass media, you’re familiar with the negative stereotypes about these communities. Yes, there is some truth to these stereotypes, but they’re sensationalized because stories of drug kingpins and police shootouts sell movies and newspapers much better than descriptions of peaceful, family barbecues and the success of local business owners. Still, I’ll address the elephant in the room before moving on. With a legacy of government neglect and social exclusion, discontent in favelas grew into resistance that organized into leftist rebel groups during Brazil’s military dictatorship that lasted into the 1980s. Over time, the Marxist and Liberation-theology-inspired factions lost their ideological roots and resorted to drug trafficking as a lucrative business. Unlike the export-focused cartels in other parts of Latin America, Brazilian groups such as Comando Vermelho (“Red Command”) and Amigos dos Amigos (“Friends of Friends”) primarily satisfied domestic demand for drugs, particularly marijuana and cocaine. Nonetheless, the favela-based drug gangs kept order in their communities, and the main reasons there’d be violence would be when police invaded favelas and when gangs fought with each other over territory. Now in advance of the 2014 World Cup and 2016 Summer Olympics in Rio, a new government initiative has installed “pacifying police units” (“UPPs” in Portuguese) in many of the more prominent favelas, especially in the city’s exclusive South Zone. Whereas favelas never had permanent police presence before 2008, now the ones with UPPs have heavily armed officers stationed in the more open parts of favelas. Still, in favelas like Rocinha with an unofficial population of 300,000, many areas continue to have drug trafficking because they are a labyrinth of unmapped alleys and stairways, which the UPPs struggle to pacify. After the arrival of the UPPs, drug-related crimes and homicides have decreased, but it seems that traffickers have fled to other favelas or Rio’s periphery. Moreover, residents seem to be disillusioned with the lack of fulfillment of social programs promised as part of the UPP presence. Ultimately, poverty has plagued favelas since their inception, and while national economic growth and some progressive social programs have brought 30 million Brazilians out of poverty in the last decade, favelas remain poor. The minimum wage here is around 300 US dollars per month, and those meager earnings don’t go very far when monthly rent for a 200 square-foot room is at least half that. The fact that real estate here costing more per square-foot than the most expensive parts of Manhattan is in close proximity to favelas crystallizes Rio’s harsh inequality. A perfect example is the five-star Sheraton Hotel and Resort within a few hundred feet of the favela of Vidigal. 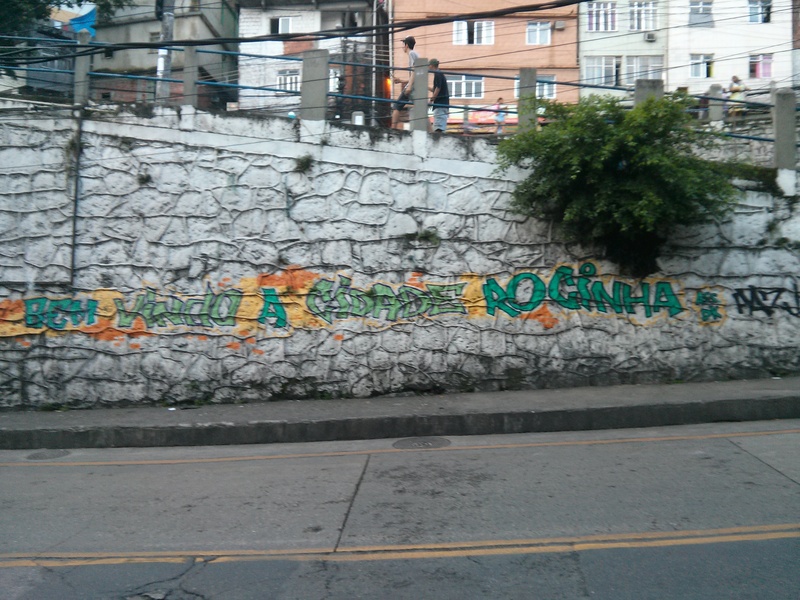 “Welcome to Rocinha City:” Rocina truly feels like a city within a city. In spite of this poverty, favelas might surprise you in terms of their level of development, especially if you understand them as “slums.” Public utilities and services such as running water, electricity, internet, public transportation, and more are very common, but they’re generally of lower quality and reliability than the formal city. Also, most homes are permanent structures made of cinder block, and some rise as high as eight stories. Residents really began to invest in their homes when the government granted them property titles about 20 years ago, and now some initiatives have even given land titles to a very limited number of residents. Businesses, both formal and informal, are widespread. There are restaurants, grocery stores, banks, clothing stores, hardware shops, electronics sellers, and more. Rocinha, Latin America’s largest favela with 300,000 residents, has national chain stores and even had a McDonald’s at one point. Still, it’s very difficult for outsiders to begin to comprehend the atmosphere and reality of favelas without at least visiting them. Here‘s a short, artistic video that I think captures the essence of Rocinha quite well. Many favelas are built on hillsides, so Rio’s one of the few cities where the poor get the best views. While I don’t think the Western world is hearing much about what’s been happening the past few days in Brazil, I’d be remiss not to mention it now. What began as protests over a 20 cent (equivalent to $0.09 US dollars) bus fare increase in Sao Paulo has now snowballed into a national movement for sweeping social, economic, and political reforms. Spurred by the widespread use of social media (Brazil is only second to the US in Facebook usage. ), the country is now seeing its largest protests since the end of a military dictatorship in 1985. Though protesters’ demands are numerous, they seem to center on better public services, greater socioeconomic equality, and government transparency. This Economist article summarizes the movement well, but since mainstream media here is concentrated in the hands of a few wealthy families, I recommend reading independent coverage, such as my friend Julia Michaels’ blog. Though the protests aren’t happening in favelas, the gripes of their residents are well represented in this nation-wide protest movement. As the wasteful and nontransparent spending for the World Cup and Olympics is a major theme, favelas are also victims of forced evictions and police abuses in the name of preparation for these mega events. In addition, just last Friday Brazilian President Dilma Rousseff came to Rocinha to announce the next phase of the national Programa de Aceleração do Crescimento (“Growth Acceleration Program”) infrastructure projects here in Rocinha. 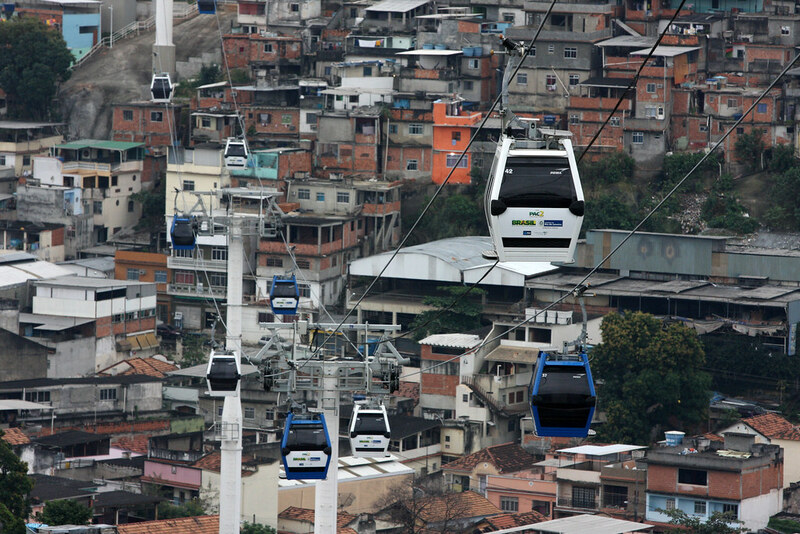 A large part of the $700 million US dollars destined for Rocinha include the construction of a cable car similar to one already in operation in the Complexo do Alemão favela. Many Rocinha residents are outraged, considering this an unnecessary excess given pressing sanitation, education, and health issues in the community. It’ll be interesting to see what real changes come out of this national movement and how favelas are affected. In the meantime, CatComm‘s RioOnWatch blog diligently covers the mega events’ transformation of Rio’s favelas. 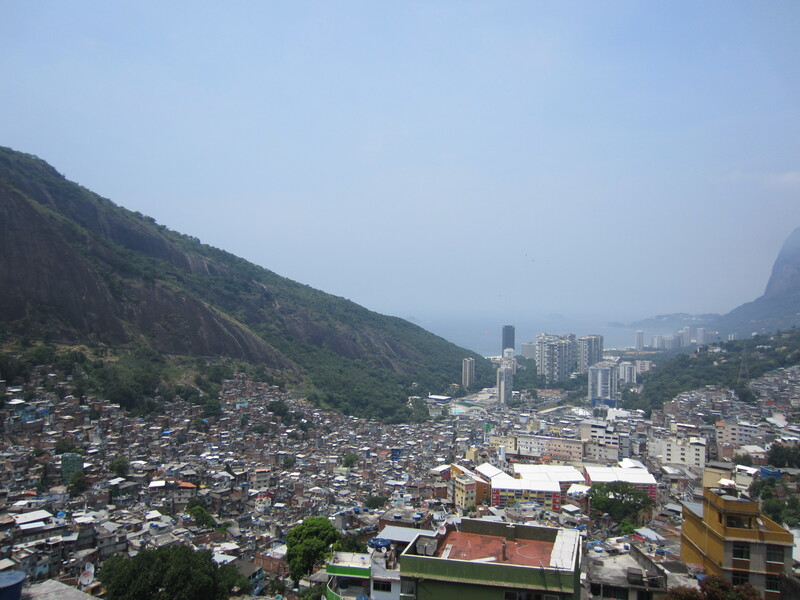 Disclaimer: Much of the information in this post is anecdotal, based on my time in two of Rio’s best known favelas, Rocinha and Vidigal, as well as the Portuguese Wikipedia article on favelas, which is somewhat different from the English Wikipedia article. Elliot, very happy to see you back in the blogosphere! I just read your blog in its entirety and visited the Favela Experience website. Honestly, I think what you are doing is incredibly profound. Your passion and dedication to the cause continue to impress me, and I’m confident that your undertakings in social entrepreneurship will not only be successful, but will also make a meaningful impact on the community. That being said, I am definitely taking a trip to Rio in the next two years and I’m glad I know where to stay while I’m down there! They too had the best of motives and plans… but not all agreed. As your father my actual quote was, “So no job in the United States is good enough for you?” That was after you complained about American cubicle jobs and all other American jobs as “soul sucking.” Nevertheless, I figure you can’t lose doing what you are doing as long as you are careful to be physically safe. Even if you are not successful financially, you already speak the language and are absorbing the culture. This is valuable experience which I believe will be in demand in the business world in the future. On the other hand, you could surprise the naysayers and make good money. You haven’t mentioned that your business is already in the black and partially supporting you. Most businesses do not make a profit so quickly. Either way, its better than a Harvard MBA. Some people blame your father Freak for the son Freak. Your watched me being creatively unemployed your whole life and somehow owning a mansion in Beverly Hills 90210. Love, Dad.